The All-Party Parliamentary Group on Arts, Health and Wellbeing (APPGAHW) was formed in 2014 and aims to improve awareness of the benefits that the arts can bring to health and wellbeing. 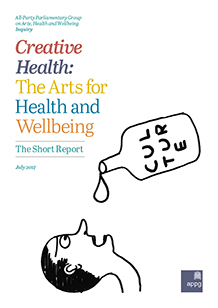 The Inquiry Report, Creative Health: The Arts for Health and Wellbeing – Second Edition, presents the findings of two years of research, evidence-gathering and discussions with patients, health and social care professionals, artists and arts administrators, academics, people in local government, ministers, other policy-makers and parliamentarians from both Houses of Parliament. View both full and short report HERE. The All-Party Parliamentary Group on Arts, Health and Wellbeing (APPGAHW) was formed in 2014 and aims to improve awareness of the benefits that the arts can bring to health and wellbeing.